San José de Gracia de Las Trampas mission church is located in Las Trampas, a Spanish colonial village established in 1751, set in a beautiful mountain valley south of Taos on the old "High Road" (NM76). Originally a lay chapel, San José de Gracia is situated on the original town plaza. 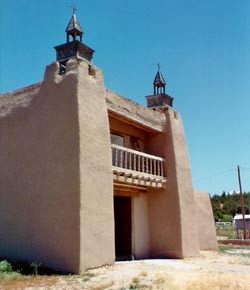 The church was completed in 1780 and is considered to be one of the best preserved examples of Spanish Colonial Mission architecture in New Mexico. San José de Gracia de Las Trampas is still an active parish church and was fully restored in the 1970s. San José de Gracia de Las Trampas, New Mexico, a National Historic Landmark, is located in the town of Las Trampas on NM 76 (the High Road). The interior of the church is only open Friday and Saturday; suggested donation.